Amazon has already become such a household name, innovating the shopping experience to the point where average Americans hardly need to leave their homes to find good deals or buy something new. And now, after the online giant announced a healthcare partnership with Berkshire Hathaway and JPMorgan Chase that is "free from profit-making incentives and constraints" to offer employees quality health care at a reduced cost, many people hope that this type of plan could innovate the health industry to make good medical care affordable for everyone in the future. Lowering health insurance costs can be possible on many levels. Looking closely at the health and health spending of employees and developing new ways to deliver services, or negotiate rates with medical providers, could serve as a model for larger scale improvements in healthcare for the country as a whole. Jeff Bezos, Amazon's CEO said, "Hard as it may be, reducing health care's burden on the economy while improving outcomes for employees and their families would be worth the effort". Insurance is based on the concept of collecting premiums from many in order to pay losses of the few. Certain costs, such as preventative care, regular doctors visits, and other medical costs can be predicted statistically. Using their existing employee population the partnership has an ideal base to test models and ideas to improve health care on many levels while providing improvements in medical care for their own employees and their families. Speculation over what the proposed health care organization might focus on, or how it may work varies widely. However, understanding the strengths of the companies involved gives hope to the idea that although combining customer service, technology, health, medicine, and insurance requires vast knowledge and resources, the trio of Amazon, Berkshire Hathaway, and JPMorgan Chase, have a lot to offer in a combined effort and partnership. Per Warren Buffet, Berkshire Hathaway's Chairman and CEO, "..We share the belief that putting our collective resources behind the country's best talent can, in time, check the rise in health costs while concurrently enhancing patient satisfaction and outcomes". "Health isn't hindered most by what is going on inside our bodies but rather outside of it. Social workers in various programs in different states have had great success addressing patients' housing issues or nutritional problems. With Amazon's acquisition of Whole Foods, they could easily provide nutritionists to patients—and then delivery food or even meals that are prepared for certain diagnoses, like heart disease or diabetes.​"
Imagine the customer-centric contributions, distribution network capability, and technology savvy of Amazon, the insurance knowledge and experience of Berkshire Hathaway and the investment contribution of JPMorgan Chase combined. It's a partnership with a strong background in many areas and a hopeful future to what they may build together. Twenty-five percent of patient respondents in a recent study by the National Patient Advocate Foundation (NPAF) said that they had no opportunity to discuss what was important to them with their doctors when they made treatment plans. Integrating these values into their plans could have an impact if they developed a health care plan for their employees. In particular developing technology that can help deliver this using data could be a game changer for the customer experience in healthcare. According to a 2017 health benefits survey by the Kaiser Family Foundation/Health Research & Educational Trust (HRET), "small-firm workers contributed $1,550 more annually for family coverage on average than large-firm workers." One hundred fifty one million Americans rely on employer-sponsored health insurance. Employer-based health solutions on the scale of this partnership could lower the cost of health insurance for the employer and the employees, which may impact a significant number of Americans and their families. Many employer-sponsored health programs have seen increases in the amount of money that the employee pays over the past several years. For example, if one of the focuses of the partnership would be to use JPMorgan Chase's investment and financial expertise in developing top HSA options for employees, it could lead to more employee investment options and savings. Financial incentives for wellness and wellness program development are already being used by several large employers. Insurance companies have already started using tech fitness trackers to give discounts for life insurance premiums, for example. The Amazon, Hathaway, and Chase partnership may provide more opportunities in areas like this, long-term, that may then be adopted by other employers or insurance programs. 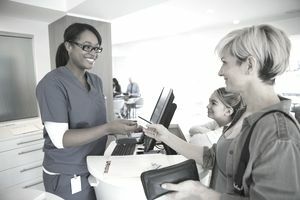 Greater opportunity in technological innovation into how care is delivered such as addressing administrative inefficiencies, scheduling issues, and access to doctors in a reasonable time would provide opportunities to reduce costs for the partners in the new health organization, as well as for the employees. Although the real ability for the trio to use purchasing power to reduce costs has been a subject of debate, there is no doubt that finding new ways to deliver health services or come up with new models in the delivery of prescription drugs could alter costs in other ways. Repackaging the process and eliminating or reducing costs associated with middlemen like pharmacy benefit managers, could provide significant savings in health care spending. You can see a really interesting graphic by Kaiser Health News here which gives a good idea of how impactful this can be. Alternately, some have speculated that the new partnership may look to get involved in distribution directly as well. Basic paperwork/data management and organization can contribute to savings in health care. For example, medical billing errors cost a significant amount of money. "Providers complain that paperwork takes up too much of their time, often out-sourcing the job to outside firms who often make mistakes or up-charge. The technology that Amazon developed for Amazon Go, " explained Ms. Donovan, "which tracks the purchases a customer makes as they pick up items or place them back on the shelf, could transition into the health care arena, making for a potentially more accurate system that demands less time from providers." Difficulty in finding care in a reasonable amount of time drives many patients to ER's where costs are more expensive for care. People may put off getting treatment because they avoid going to ER's until the problems have progressed. Developing an app or connected network where appointments could be scheduled, doctors could be rated, and access to resources for care would facilitate many peoples lives. Imagine the possibility of creating a way to make same day appointments, and compare costs in the process. The 2017 “Complexity and Opportunity: A Survey of US Health Consumers’ Worries and Wants” survey by Oliver Wyman and FORTUNE Knowledge Group found that when it comes to paying for add-on services or products, respondents were most interested in convenience-related services, such as same-day appointments and home visits. Amazon, Berkshire Hathaway, and JPMorgan Chase wouldn't be the first to embark on finding ways to innovate health care to save on costs. Google is invested in many projects through Google Health. Many startups and other businesses are also already focused on the health sector all innovating for the future. It makes sense these three giants should be on board. One example that may give you an idea of what can be accomplished in one small area alone is SaveOn Medical which provides "an online marketplace for medical procedures that uses price transparency to help patients make informed decisions based on cost, quality or convenience". In news stories, such as this one from NBC, they share an example of how it saved one patient hundreds of dollars for just one procedure. What's the Benefit When Employers Become More Invested in Employee Health Care? Taking care of your employees will inevitably create a more profitable company. Preventative care can help reduce the costs of problems later down the line when people don't have access to health care, which contributes to employee absenteeism, disability, and increased medical costs. Providing employees with services and benefits they want and value also contributes to employee retention. Regardless of how the new partnership goes about addressing the long list of issues and problems with the current health care system, the fact that they have announced a commitment to start working on finding ways to improve issues is a step in the right direction. The innovations or ideas they put into play will surely model new opportunities for everyone on a long-term scale.